I am sometimes asked How Can Councils Help Bees? What can we do in our communities to help bees? These are good questions, because you and I can exert a great deal of influence on the activities of councils in our local areas. So why not ask your council to help bees and pollinators? In the end, helping the bees is everyone's responsibility. There are many ways in which councils can do their bit - indeed, they have major control over how large areas of public land is managed, but remember, they work for you! In general, the cost of helping the bees can be negligible – whilst the cost of not doing so could be very high ultimately, not only in terms of the loss of pollination services for the growing of food, but also the loss of biodiversity for future generations. We are not only talking about the loss of bee species here, but the potential demise of flower landscapes, and the inability of plants, trees, shrubs to fruit and produce seeds upon which birds, mammals and other creatures may depend (directly or indirectly). How Can Councils Help Bees And Other Pollinators? by encouraging education and awareness. But anyway, here are a few specific suggestions you could share with your local council and community groups. I’m sure you can think of more! How Can Councils Help Bees? A Few Ideas…. Ask your council to create a local ‘Pollinator Protection Plan’ – with specific actions they themselves, and any sub-contractors they pay on our behalf (to manage land and planting schemes in public spaces) must implement. Ask the council to include regular progress reviews. 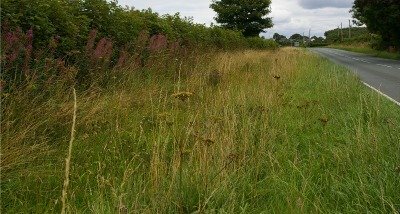 Ask your council not to mow the roadside verges, and instead, to designate them ‘Pollinator Verges’ (you could even call them ‘Bee Roads’!) and to actively create and link up pollinator corridors to wildflower meadows and habitats. Having regularly phoned my local council over the last few years, I can tell you, the message has got through! I have encouraged others to do the same. Our local council has significantly reduced mowing of verges as a result. Be sure to phone up your council and praise them too, when they get it right. Also, do be aware that there are sometimes genuine reasons why a roadside verge must be mown – for example, to maintain visibility at road junctions etc. Councils can Help bees by leaving wildflowers to grow along roadside verges, of course! Below is an example of an un-mown roadside verge close to me. It may not look much from the photograph, but it really is ideal for bees and other pollinators. The verge features a variety of wildflowers and grasses, including knapweed, clover, colt's foot, dandelion, rosebay willow herb and more. 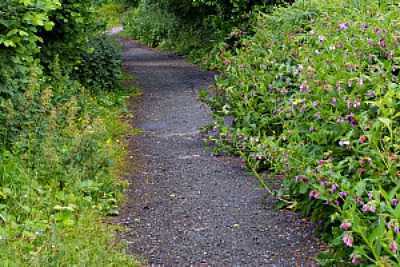 The hedgerow behind is mixed, and contains honeysuckle and stretches of hawthorn among others. Tell your concil you are happy for country lanes used by pedestrians to be left unmown, instead of the obsession with close cropped, tidy (and sterile) verges. This country lane (below) is literally around the corner from my home. It really is bumblebee and butterfly heaven, due to the comfrey, teasels, ivy, nettles, hawthorn and many other wildflowers growing, and it is never mown. Instead, it is left to die back naturally in the winter. Ask your council to replace low value bedding plants in formal planting schemes and floral hanging baskets in town centres with flowers of value to bees and other pollinators. See these resources for ideas of plants to include. 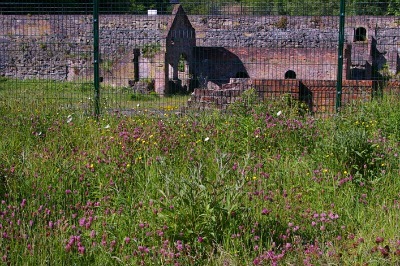 Areas of waste land, brown field sites, derelict and ruined sites can become a home to pollinators. Below you can see such an area, again, close to my home. Although it is not easy to identify the many species of wildflower growing in this location, I can assure you, it is pollinator heaven! Bumblebees, solitary bees, honey bees, and a wide range of butterflies, moths and hoverflies can be seen feeding on a range of flowers, which includes red and white clover, bird's foot trefoil, knapweed, ox eye daisy, various mallow, rosebay willow herb, buttercups, ragwort and more. Ask your council to commit to creating a specific pollinator garden, or designating a space for a pollinator garden to which members of the public can donate bee-friendly plants. Ask councils to preserve hedgerows and trees for bees and other wildlife. Read more about the importance of trees and hedgerows for bees. Ask councils to encourage other publicly funded bodies to do their bit for bees and pollinators – and where possible, require them to do so. Again, a garden outside a health clinic or hospital could be designed with bees and pollinators in mind. Ask your council to identify and protect areas where vulnerable species of bees and other pollinators exist. Ask the council to ensure the needs of bees and other pollinators are incorporated into land and building planning. Please ask your council not to use pesticides in planting schemes lawns and public spaces. Ask them to adopt an organic policy for sourcing and growing plants for their planting schemes. Councils are in an excellent position to encourage local businesses to participate in creating bee-friendly spaces where possible. Support your council in their efforts to create space for bees and other pollinators. 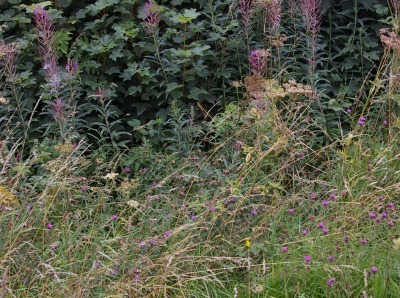 One reason councils come under pressure to mow verges and use chemicals, is because of the obsession with tidiness. It's a fact, for example, that wildflower verges trap litter more easily than neatly mown ones. The sight of litter can cause the public to phone in and complain. Anything you can do (such as speaking to your school and the local radio station) to discourage litter throwing will be a real help. Again, giving positive feedback and asking others to do the same, will help the council to take a decision not to react to the first negative comment from those who do not understand the importance of these wild flower spaces for our bees, butterflies, moths and hoverflies. How can councils help bees with regard to educational resources? One of the simplest ways is by providing educational materials and resources on the council website, not only for schools, but also for members of the public and even businesses to download. Generally, there is no need for councils to reinvent the wheel on this, because there is so much information available on the internet. The role councils could play might be to research various sources of information, and offer links in one place (i.e. the council website) to some of the many resources available. Alternatively, perhaps the council could come to an arrangement with a relevant wildlife conservation charity to distribute or use any material they have already generated. Councils could also encourage and help schools to create pollinator gardens and bee gardens (see this further information about creating a bee garden). Budget permitting, perhaps they could distribute packets of wildflower seeds to schools? I’m sure you can think of more ways in which councils can help bees! Together, we really do make a difference!